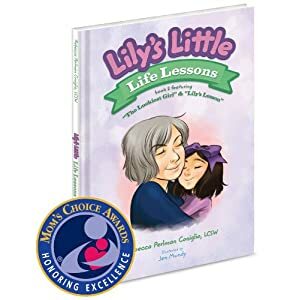 Dad of Divas' Reviews: Book Review - Lily's Little Life Lessons Featuring "The Luckiest Girl" & "Lily's Lesson"
Book Review - Lily's Little Life Lessons Featuring "The Luckiest Girl" & "Lily's Lesson"
Lily shares the daily fun she has with her Nama, and how she and Nama make her Mommy feel like The Luckiest Girl. In Lily s Lesson, Lily hears a gentle tale that answers her difficult question, Why don t Nama and Papa live in the same place? In the second book of LILY'S LIFE LESSONS, she tells of the love she has for her grandmother. Lily spends time with her grandmother and they share many activities that are fun. If you are a grandparent reading this story to your grandchild, this is a great opportunity to discuss the fun things you do together and then plan other activities you will enjoy in the future. The second story in this book is about divorce. Lily asks why her grandmother and grandfather live in different places. It is explained by her mother in a factual and beautiful way. A young child like Lily will hear such a story and may not understand it at the time, but the topic should be discussed when the question comes up. You may find this part of the book helpful if you have a similar situation in your family. Again, a good time for open discussion. Once again , the author has brought up family issues that once you read the story, may help your family to springboard into a meaningful discussion.